The gold-standard in micropore analyzers. Patented, dry high-vacuum system, ultra-stable transducers, three pressure ranges seamlessly overlap. With up to three micropore stations, each with its own dedicated set of pressure transducers. "MP" = 1 torr, 10 torr, 1000 torr transducers set. "XR" = 0.1 torr, 10 torr, 1000 torr transducers set. Turbo-level degassing and metal O-rings and gaskets in critical measurement zones perfectly complement low starting pressures for true micropore analysis. There are also the models for very low surface area and thin film analysis using krypton gas. 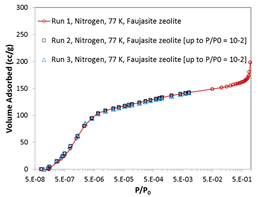 A typical physisorption analysis starts with degassing of the sample. The desired protocol of heating rates, hold times and automatic testing are loaded, and then the iQ takes over. After completing the timed protocol, or sooner if the residual pressure rise passes the user defined test limit, the iQ shuts down the degasser, backfilling the sample cell or leaving it under vacuum if preferred. Comprehensive physisorption calculations include specific surface area (single and multi-point B.E.T., Langmuir, STSA, t-plot, alpha-s, DR), pore size (BJH, DH, DA, MP, HK, SF, Monte-Carlo, NLDFT, QSDFT) with their corresponding surface area values, Kr-pore size for thin films, heats of adsorption, plus NK and FHH fractals. The DFT library is the most extensive available commercially; no less than twenty six statistical mechanics-based models describing different pore shapes, chemical nature of the surface, specific adsorbate and temperature pairs, and unique ability to fundamentally account for surface roughness and heterogeneity of real solid surfaces. Reproducibility in the ultra-low pressure range is demonstrated in the XR model using 0.1 torr transducer. These chemisorption models are available with or without BET/mesopore physisorption capability. Ideal when micropore size distributions aren't needed, or your lab already has sufficient physisorption capability. 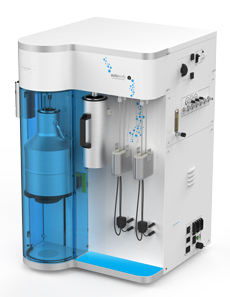 The physisorption-capable model includes four degassing stations and the option to add up to more physisorption stations.